Also known as the early stages of TearRing Saga. the successor of the Fire Emblem series- for the original Playstation. Right before the game’s release, its title was changed to TearRing Saga, which according to publisher Enterbrain was due to “various circumstances”. Many fans speculated that the change was made to prevent Tirnanog and Enterbrain from being sued by Nintendo. Regardless, Nintendo filed a lawsuit not long after TearRing Saga‘s release, which eventually resulted in Enterbrain being found guilty and fined for breaking the Unfair Competition Law, but not for breaching the Copyright Act. 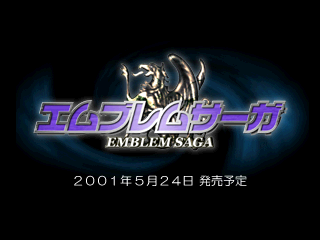 The majority of the information about Emblem Saga originates from a featured article by Famitsu (a famous Japanese gaming magazine published by Enterbrain), which also included a detailed interview with Kaga. Discussion with Developer Shouzou Kaga About His New Game! —First, let us listen to Mr. Kaga’s comments about the games he’s made so far, as well as this game’s relationship to them with regards to the story. Kaga: I’ve made five games, which took place on three continents. Emblem Saga takes place on a fourth continent called “Forceria” and its atmosphere is the same. In this world, the Manakete tribe once flourished, and they built a highly advanced civilization. As history went on and they faced destruction, how did they deal with humans, the masters of the new age? The Manaketes… or rather, ancient dragons are involved deeply in this game. As they faced destruction, many of them chose to sleep underground eternally and hide their faces from the world, but there were those among the Manaketes who resented the humans. The story concerns those wicked men who sought to use their strength and the people who opposed them, as well as the shrine’s holy guardian dragons who appeared because of a certain pact. The status screen of Warner, a Social Knight. His portrait belongs to Julius in the final game. The stats to the right of the portrait are: Attack, Range, Accuracy, Avoid, Critical and Attack Speed. Towards the middle are the new “Attribute Resistance” gauges. The higher the gauge value, the higher the defence bonus the character receives when being attacked by a weapon of that type. The stats to the bottom left of the screen are: Strength, Skill, Speed, Luck, Defence, Magic, Resistance, Max HP, Movement and Cost. Warner’s equipment consists of an Iron Sword and Vulnerary. —Mr. Kaga, it’s said that empathy is going to be a strong point of your new game’s characters. What kinds of characters are going to appear? Kaga: About the empathy, I blame the scenario (laugh). This time, you will once again cry at the sad parts and laugh heartily at the funny ones. Of course, I want to write sweet conversations that will put you on edge and dramatic words as well. I can’t mention specific details about the characters yet, but I’d like to create an old (father-type) guy with the charm of an innocent child, as well as a certain vile-looking but kind-hearted character. Also, I’d like to have a sensual Arabian-type young man and an evil woman in her thirties (laugh). Comment: There seems to an unused portrait of an Arabian-style youth in the final game. The evil woman could be referring to Sierra. The article also showed off artworks of Kate and Julius. —Will characters from previous games make a return? Comment: The “shape-shifting youth” could only have been Xane. —Dark Dragon and Sword of Light takes place at the same time, so that must mean the main hero is related to Marth! —You just mentioned that a young hero like Marth would appear “as well”, what does that mean? Kaga: Oh, that! Like in past games, the game’s story will be centred around a young prince, but that doesn’t mean there will only be one main character. Kaga: I’ve always thought that allowing players to choose the main character would be interesting. This time, there will be multiple “armies” that can be controlled on the world map. As for which characters can lead an army, each character has a rich background, so any character has the potential to become a main character. Although the missions that each army can undertake is fixed, but there will be a lot of freedom from the middle and onwards, and you can focus on your favourite army to progress the story. 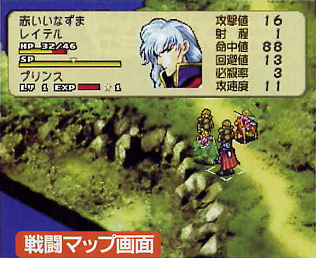 Players could freely divide their characters into armies of up to 8 units each and move them around the map, “just like in Fire Emblem: Gaiden.” The characters within an army may be able to support each other to develop love or friendship. The army being selected belongs to Faris of the Remris Knights. Their tactician is Warner (presumably the character from the screenshot above). The stats to the right side of the portrait are: Emblems, Gold, Income, Cost, Army Strength and Storage. The menu items to the bottom left of the screen are: Move, Create (army), Unit, Item, Wait and Pass (forfeit your turn?). —Has the properties of each army already been decided from the start? Kaga: Of course, the starting attributes will be fixed to some extent, but they will change depending on the player’s methods of playing. This time, we’ve considered various areas related to each army’s attributes. Based on these areas, players can make their own decisions as to how to personalise their characters. For example, if you only fight in arenas, by the end of the game, your army may become proficient in arena battles, but it may be weak in group battles. Another example, say you constantly battle cave monsters, perhaps your army will become invincible against monsters, but their personalities will become negatively affected. —Sounds very interesting! So, depending on the enemy and location, the properties and personalities of the armies will undergo change. —A lot of effort has been made to craft character growth, I bet this will also affect the story! Kaga: There is another new change related to growth. Past characters possessed something known as growth rates, which is basically using fixed chances to decide growth. This time, instead, there will be growth curves, which vary according to character. This allows us to have things such as fast growth and slow growth types! —I see. So if you don’t try out each character, then you won’t know which characters are good or bad. Kaga: That’s right. Although they start off weak, but by the end they may become shockingly good! —Next up, I want to ask about the game’s difficulty level. Why have you created this game in the image of Gaiden, which is considered a low-difficulty strategy game? Kaga: About this problem, we have various means to solve this. One would be to design the story battles to increase the strategic challenge. Not to mention, the artificial intelligence has been given a huge upgrade, and the enemies will be very efficient in both strategy and combat. Also, because battles utilise an isometric perspective and units have their own direction, ancient basic war strategies like rear attacking or surround and annihilate can be faithfully recreated. To incorporate war strategies used by famous generals like Hannibal and Caesar into the games has been one of my goals. A screenshot illustrating the isometric view that was going to be implemented in Emblem Saga, as is often used in tactical RPGs such as Final Fantasy Tactics. Like those games, the direction of each character plays an important role- attacking an enemy from the back would give the attacker a distinct advantage. 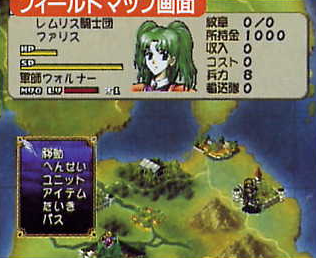 In the final version, the isometric view was scrapped in favour of the standard top down view used in Fire Emblem. The character being highlighted is Reitel, the “Crimson Lightning”. His class is Prince. The stats to the right of the portrait are: Attack, Range, Accuracy, Avoid, Critical and Attack Speed. —As well as these, are there other new elements? Kaga: Although I cannot describe them all at this current stage, but in the future, there will probably be endurance and cost to consider. Endurance will reduce after performing actions or when attacked by an enemy. After falling below the halfway point, it will reduce the character’s fighting ability and when it reaches 0 the character will be incapacitated. As for cost, this is used to pay for units, and is deducted from your possessed gold whenever the army moves. There will be many methods to increase the amount of gold in possession, but the most effective is to utilise Emblems. When an army possesses an Emblem, they will be recognised as an official squadron of their kingdom, allowing for an increase in income each turn. Comment: In TearRing Saga‘s data, there is an unused Emblem, which states that it has this effect (although it doesn’t appear to do anything). —What other methods of gaining gold are there? Kaga: Other methods include investigating caves and ruins, fighting in the arena, sending mercenaries on missions and Thieves can also obtain gold. —I see. To finish off, can I ask about any new features that we can expect due to developing for the Playstation? Kaga: Is that it? I am personally interested in where the save date is stored, which is outside of the physical software. We are considering making the save files for this game affect the next game. If it becomes a series, the situation may arise where characters from this game pass on their attributes to the next. Although I say this, but this is still very far from now, so I don’t know what may become of this idea. In any case, I hope that this product will leave a good impression on players. Please look forward to it! 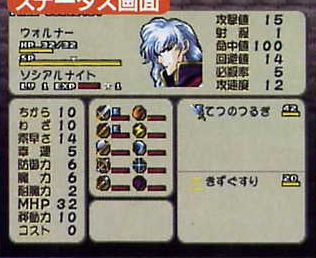 Runan, one of the main characters of the game, initially had blue hair and was of the Lord Knight class. However he ended up with brown hair instead and started off as a Knight Lord. The hair colour change was probably because the previous Fire Emblem heroes mostly had blue hair (eg. Marth, Arum, Sigurd), but then again the brown hair makes Runan look like a total Leaf (the hero of Thracia 776) clone… Also Sigurd had the Lord Knight class.